Distributed Teams: Wut “red” day!? 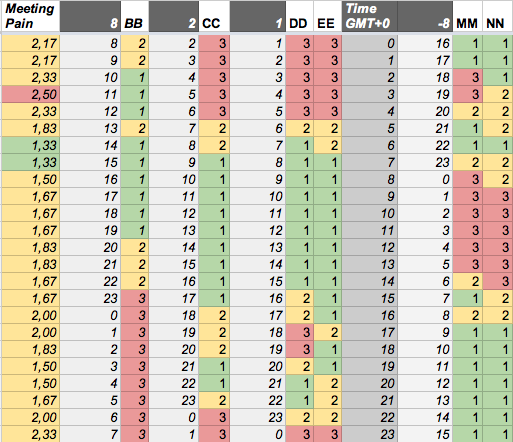 We’ve talked about time zones and examined the clock in a lightly distributed team. That should be enough – right? Nope. There are other surprises like vacation …and parental leave …oh, and “red days”. You might think that all of this is straight forward and regulated, or at least well-known. Well, it is probably “self-evident” per country, as in “evident to myself and no one else”. Let’s serve up some examples on what might hit you. “Red days” is the Swedish name for public holidays and comes from the ink used in most cellulose calendars. Red, public, bank – whatever your prefix is on the word “day”, it usually means “day off”. Just as the names differ, so do most things about them. Countries like China/Hong Kong, Egypt and India and many more have roughly 15 public holidays off per year, but remember to take vacation into account when looking at these numbers . Rules, tradition etc play important parts, some are on fixed dates, others move around a lot in the calendar. So, get to know your locales. Another gotcha on public holidays: You can’t even trust that the “day” is a full day. In Sweden a day like Walpurgis (“Valborgsmässoafton”) and several more are in a “shady red”. Meaning it will be marked as a “day off” in the calendar, but not be regulated by law and instead up for negotiation. Most Swedish companies treat this as a half of a working day. But sometimes this is even more complicated. Some companies add an extra hour added to such a “half day” as to turn other “squeeze days” into vacation . Oh, you can’t trust days off to be per country either. In New Zealand there is the “Auckland Anniversary Day” which celebrates the arrival of Captain Hobson  (yup, this public holiday the man the celebration himself). This day is only observed in the northern half of the North Island of New Zealand following some regional boundary abandoned in 1876. You can’t go local enough, right? Turn on public holidays in your favorite digital calendar, but don’t trust what you see there. Set up some policy. Despite rules and regulations there is usually some interpretation to do. Set expectations with the people in your team/company. I prefer to have people kick in when needed and letting “red days” mean time off. “Black” is my name for those days. Whatever you might think, these days are off – whatever the calendar or law might say. Case in point: Mid Summer’s Eve. 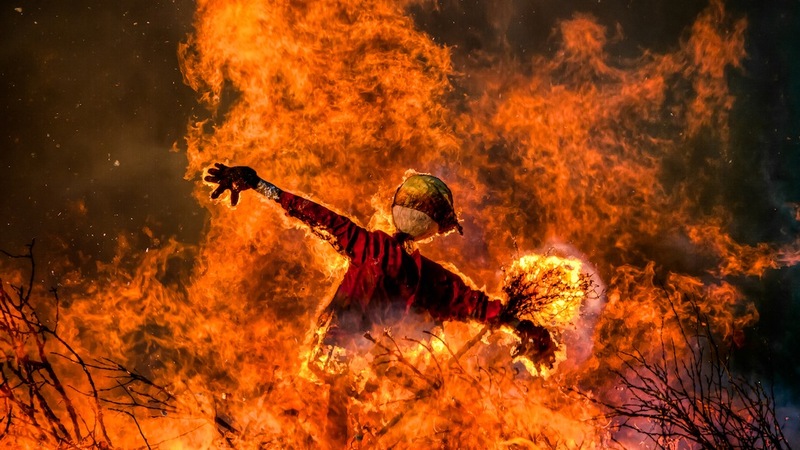 The event marks summer solstice and is a common celebration in places like Scandinavia. If you lived here, you would understand why. However, the eve isn’t actually a public holiday in Sweden, at least not regulated by law. Whatever you might think, you are not likely to change such a “black day”. Hint: Mid Summer’s Eve been like this since the stone age. The Christian church gave up and dug up saint St John to celebrate on the same day. Take a break and have fun! That is quite a difference. The differences do not stop at the number of days. Culture plays a big role too and will affect your ability as a team to deliver. Take for instance the UK with less vacation length than the Swedes. When the latter go for vacation they clock out for an extended period. In my experience the brits tend to take their annual leave in bits over the year and typically extend weekends etc. In some places where I’ve worked, work culture on the UK side made the people go into a semi-stealth mode when they approached holiday. Suddenly, with a heads up of just a couple of days, a small note would silently appear in the calendar. Or during your colleague’s vacation you just got your email got an auto reply saying “Sorry, but I’m away today on annual leave”. Surprise. Your mileage is likely to vary, but do take local customers and rules into account when you plan your support and deliveries. Plan! A simple Google doc where you note please vacation goes a long way. A common calendar might work if you’re a small team, but doesn’t scale. Specify. Where I’ve worked we typically went glocal, meaning we usually followed the laws and tradition per country. People plan their lives around these days and trying to set some standard across board is usually not worth the effort. As you might suspect there could be consequences for your team . This varies a lot, but I’ll use Sweden and fathers as an example. The parental leave here are among the best in the world and society is changing quickly. I do see signs of similar improvements on various levels in other countries. I’ve taken two paternity leaves of them myself nearly a decade ago, each on the order of three to four months. They we’re great. Today, within IT, I typically see the guys taking closer to half a year. That is a big shift in a rather a short period. All of this is very different across countries. But I’m sure that it does affect your team somehow. Read up on rules and regulations per locale. Help the parents to solve their life puzzles. You will get loyal colleagues and their help late in the night. Plan. In SE: Having a baby today means two weeks off for the father and, a year from now, several months of paternity leave. When it comes to handling things like time and vacation etc in a distributed team it usually works the best if you go multinational, not international – in others words, adapt. In my view there are too many problems in standardizing. Just plan and make it transparent to the team. You got other goals that are more important. I think I covered as much as I can handle – and probably you too – on the subject of distributed teams and time. Next blog up: What’s the secret ingredient in just about any method/dogma that promises to save your distributed team? “Squeeze day” – a day that land in between regular public holiday and a weekend. Thus, they are very interesting to turn into a day off and have a long weekend. Consensus does have its advantages though, like the ability to get a group to work towards one single goal. But that’s another blog. So you’re a nice guy – right? And you want to find good time for a recurring meeting with your team. In my previous post I had a tip on how to find any possible sweet spots when the team could meet. This time around it should be easier? We just need to find a single bona fide rendezvous during office hours. Surprise (not), it’s harder than you might think. Let’s first define the traits of a “normal” distributed team. only two offices – Stockholm and London – which is only one hour time difference. That’s a fairly easy set up, right? I’m just going to point to a couple of possible snags. We have seniors in this mix. That probably means some might be parents. And of course remember the usual blend of culture and late mornings. And we do want the team that is awake and ready to go. Given that I think and live in CET-land (GMT+1) I’ll use that as the base for the clock. First, let us set the frame for the “office hours”. It is probably something like 8:00 to 16:00 (4 pm), see a) in the figure below. We could argue that 17:00 (5 pm) would be a more decent finish time, but then again most companies within high-tech run flexible hours. The latter is especially true if it’s a startup. You probably prefer for people to kick in and save the day, however late it might be. So the team mixes the times for coming and going. As luck would have it, some devs in your crew are singles. This means late mornings and our day start at around 09:00 (CET), see b). But then again the same is likely in the UK, hence add another hour for the time zone difference, see c). We’re now at 10:00 (CET). Lunch, we don’t want to meet during lunch. Swedes wander off to find carbon-hydrates at around mid day, but there is problem lurking here. It’s good example of what I would call a “cultural time zone difference“. To my surprise I found that the English would eat starting their 1 PM (14:00 CET), see e). Nothing wrong with that, but it does make the hour in between the lunch periods less useful. Do you want to risk a late lunch in Sweden to collide with hungry English waiting for the meeting to start? 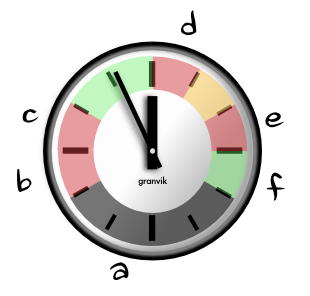 Figure: The Hound Dog Clock for the team (GMT+1). Result: Only one decent green period left. That leaves one green period between c) and d) and of course f). Just one other problem though, remember I wrote we had a mix of seniors and juniors. Some of the senior devs need to pick up their kids from the day care center. That probably means they need to leave at around 16:00 (4 pm CET). Except, one of them has a long commute, like an hour. Which means that for half of the week this dev needs to leave at 15:00 (but he/she does get in real early, like 07:00 when nobody else is around *). Even though this scenario did not have very strange constraints, we still landed with only one decent green period during the day, 10:00-12:00 CET and a possibly false green late in the afternoon. That’s not much. You would have to look at your team and your setup to see which possible greens you have. Understand your people, tweak expectations and agree on some compromise, that should get you some more green. * Disclaimer: I’m the proud father of three and I’ve tried to evenly split the picking up/leaving kids through the years with my wife. It ain’t easy. Time zones are deceptively easy. I mean how hard can it be to detract or add a few hours? Well, it turns it is tough – real tough. Here’s a tip on how to figure out when people in different time zones can meet. The arithmetic might be easy, but it’s easy to get confused when try to figure out who has switched to summer time and if the mail thread is still talking in CET or PST. Then there is culture and just plain personal preference which make things even harder. The trick is to look beyond the zones themselves. It’s not a question of figuring out “office time in KL vs. SF” – it’s all about the peeps. The goal is to match people’s lives against each other. Here’s a simple tip on how to figure out when people can meet. The short story: Get people’s preferred meeting times, a.k.a their “profiles”, assemble the team(s) and average everyone’s pain levels. Finally build a “meeting pain” diagram where the valleys are the sweet spots you’re looking for. 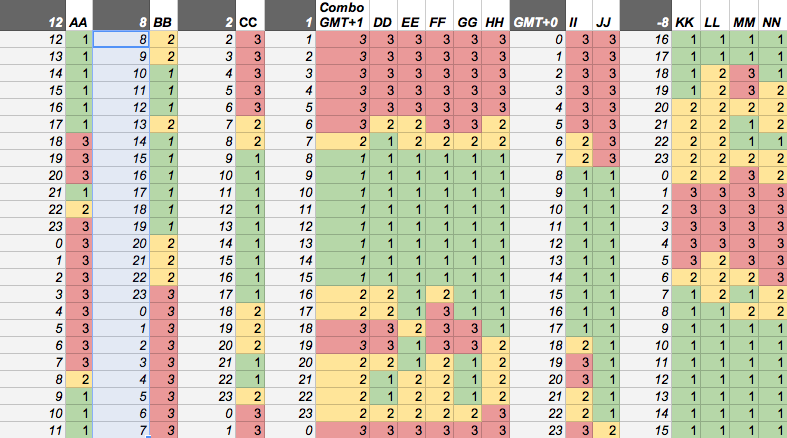 For the longer explanation we need some spreadsheet magic. In the first tab we collect everyone’s preferences, their profiles. We will reused further on. Figure: The first tab in this time zone sweet spot analysis contain all the people. They have entered their typical daily “profile”, i.e. when it’s ok to disturb them or not. Hint: red is no good. The tab we organise according to the time zones. The dark grey top left cell “12” is New Zealand time zone (GMT+12), then onwards through Malaysia (GMT+8) and so on. Note that GMT+0 is the point of reference and the other time zones merely say the corresponding hour. To the far right you can find the people in California (to the right of “-8”). Invite the people and ask them to rate the hours on a typical day throughout the 24 hours. Yeah, this is for startup purposes – it’s a hard life around the clock. Now you can align people’s lives, not just their time zones. Side note: The column “Combo GMT+1” is just a handy way to understand the joint profile of the people working in Sweden in this case. Figure: On a new tab we assemble the people needed for “Team X”. It is a simple case of creating references to columns in the first tab. To this we add a summing up column “Meeting Pain”, see far left. On this second tab above we collect the people to join Team X. It is slightly tedious to copy and paste the references, but once you get the hang of it it’s straight forward work. Next step is to introduce a column “Meeting pain” where you calculate the average of the participants for every hour. 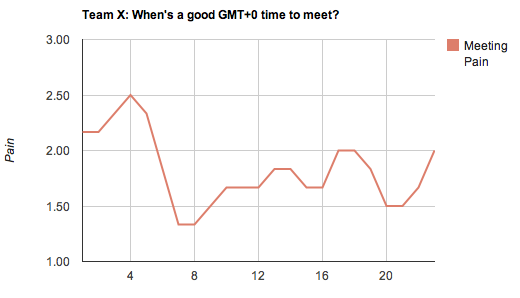 The GMT+0 column is there so that we can have a normalised x-axis in the diagram we’re creating. Figure: Finally we arrive at the diagram. Lower is better, less pain to meet. This team’s sweet spot is around 8 o’clock in the morning (GMT) with a runner-up 12 hours later at 20:00 CET just before the eastern person “BB” goes to bed. In conclusion: By relating people’s lives via time zones – everyone thinks about their life in their zone – we stand to figure out when they are more likely to meet. Oh, and a surprise insight: In principle I could only find two types of profiles – parent or not. Figure: Two types of profiles – those with kids (DD) and those without (EE). In the figure to the left we can see examples of the two types. Person “DD” is a typical parent – morning time is early and the dinner is sacred, but then this person typically makes up for a bad (work) conscience by kicking in later that evening. The other type “EE” has no kids and sleeps a bit later in the morning, but has no qualms about meeting and eating. However, this type of person prefer to round off the evening without work. I hope to write a few blogs on distributed teams. Things I already knew but didn’t have deep enough respect for or just realised over the last year or so. It will be a mosaic of thoughts with probably only one red thread – pragmatic points of view on working in a distributed environment. I hope that something will be worth while reading. Oh, yeah there is one other red thread: It’s all about the peeps!